In looking back on episodes seven and eight of Just Because!, it genuinely feels as though those episodes were in a way a fairly bubbly (by comparison) reprieve from some of the existential and romantic angst that has come from the show in previous aspects. The focus on Eita’s dedication to Natsume, the admittedly fun date that Komiya dragged Eita into, and Souma’s optimism over his possible future prospects with Morikawa all really gave the last two episodes an easy sense of genuinely not having to worry too entirely much about what the future holds. It is, of course, a naive sort of reprieve, one which comes with some of the youthful and childish kind of optimism that is so easy for us to hold on to. I guess it’s only appropriate, then, that with the episodes nine and ten, “Answers” and “Childhood’s End”, we are brought fully back into the show’s dealings with difficult questions, and some genuinely painful, adult answers. We’ll get into the complicated situation that is Eita and Komiya, but we’re going to save that for last, simply so that we can save all of that discussion for one uninterrupted look. Instead, we’re going to start with some other difficult, adult issues. The shortest issue right now would be that of Natsume’s reconciliation with her feelings for Eita, and how she is handling her future currently. In the last few episodes, we saw how Natsume came to terms with her crush on Souma, and how she was honestly no longer sure whether or not she really had romantic feelings for him any longer. Here, though, she is finally sure of it when she talks to Morikawa about him – she’s come to realize that she definitely did like Souma for a time, but that time has long since passed. She has such confidence in this not just because she’s realized how much of a hangup it was for her for years, but also because she has come to terms with the fact that she’s harboring some genuine feelings for Eita, which is an incredible development for her. She is definitely not making excuses any longer, and she is full-on pursuing what she wants, not having it be dictated by what anyone else says or thinks. And that also includes changing her first choice for college from her sister’s college to Joei. Speaking of the future coming to a head real quick, Souma and Morikawa have a pretty incredible moment in this pair of episodes, as well. There are a few smaller things here and there that come about, but none so important as their talk at the baseball diamond on Valentine’s Day. Giving a play-by-play summary of the scene really wouldn’t do it justice, but essentially, Morikawa rejects Souma once again, but with a request of him to wait for her. It is not, however, a rejection due to a lack of feelings for Souma. It is a rejection made through facing the difficult facts of adult life – that with her being in college and him beginning his career, the two of them are not going to have the opportunity to see each other six days a week any longer. That Souma traveling to see her every week would be financially impossible for him, even on the most bare of minimums. That they are both going to be needing time to focus on what is about to be directly in front of them. But her request for him to wait for her is also one that makes sense – that if he still has feelings for her in time, once they have both settled down in their new situations and have become stable in those spaces, that she would be more than happy to go out with him. Just Because! really just continues to hit hard and surprise me with how genuine and real it gets with its approaches to these very difficult, very real, and very familiar scenarios that myself and others I know have found ourselves in over the years. It’s not working with some flaky, silly kind of love story that we’ve seen a thousand times before in high school romance shows. 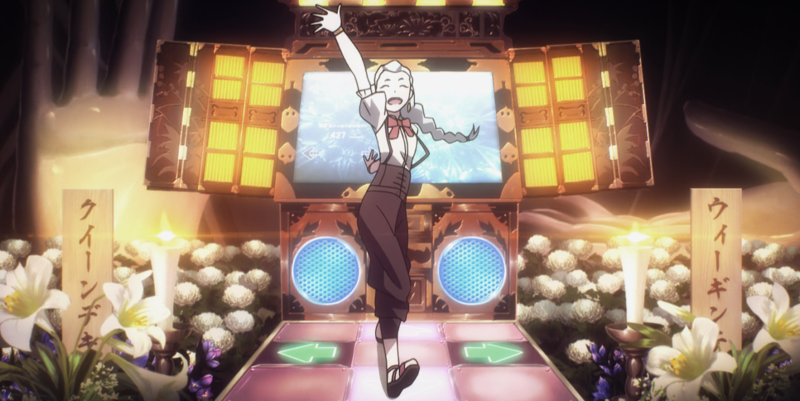 Not to say that those are bad or don’t have a place; they certainly do, and they can provide a great deal of enjoyment from them, but it’s also important to have shows that can deviate from the beaten path and go for something less contrived. But it’s these moments that strike so close to home that make this show so genuinely incredible to me. We’ve come to see Morikawa and Souma grow so much from their initial selves at the beginning of the show, and they are coming to the end of it as much more mature, patient, and genuinely, to a degree, more wizened for their experiences. With this and the above picture, as well as others not shown here, Souma displays such an incredible range of emotions and it’s pretty much the absolute best. It’s a very different scene than it is for Morikawa and Souma, who, at that concurrent time, already seem to have some sense of established, reciprocal feelings for one another. In their case, there was a clearly established confession from Souma, and an equally-clear request of time by Morikawa to process her feelings for him. Although things between the two of them are clearly not the same as they used to be, they are still able to get along to a pretty normal degree. With the beginning of episode nine, though, this is clearly not the case for Eita and Komiya – Komiya has essentially confessed, and Eita has not provided an answer at all. Granted, the two of them have come to such an awkward state that it’s difficult for the two to be around each other at all. For the majority of the episode, any interaction between the two of them ends with Komiya literally running from the interaction, so Eita couldn’t give her an answer even if he wanted to. Things are irrevocably changed between the two of them, and they both know it. Oh boy, I sure love remembering awkward “oh god I said something entirely embarrassing and now I can’t be within five miles of this person” moments from my past. Good times. There is a definite try for reconciliation and a restoration of what once was between the two of them, though, as Komiya, in her words, “ambushes” Eita with some tea while he’s out on a run. For a brief period of time, they talk like they used to, but the conversation is cut short by Komiya driving away, with a cheery sendoff of “let’s get along like this from here on out!” Eita does give a response, but it’s to himself at this point, acknowledging that doing so is, at this point, pretty much impossible. And honestly, it’s hard to argue with him at this point. Both Eita and Komiya have pretty well-established endgames at this point – Eita is pursuing Natsume, and Komiya is pursuing Eita. The two outcomes are pretty solidly in opposition of one another, and anyone who’s been watching the show up until this point can pretty clearly see that Eita does not reciprocate Komiya’s feelings for him. On one hand, it can seem like there’s such a strong sense of futility to her actions, because Komiya knows for a fact that Eita has strong feelings for Natsume, and she’s even supporting Eita’s pursuits in spite of that. But that’s part of what makes Eita and Komiya’s bond so genuinely compelling and real. It’s clear that Komiya loves Eita so much that it probably hurts at this point. But it’s a kind of love for a person where you want what’s best for them, or what would make them happy, even if that outcome doesn’t necessarily bring you the same degree of happiness. At the same time, though the result has not been exactly identical for Eita, his time spent with Komiya has genuinely opened his heart in a way, taking him from being the aloof transfer student that sees her as an annoyance to a genuine friend who wants her to succeed, though perhaps not in the romantic fashion that she would want. The last scene in these two episodes, in which Komiya calls Eita to meet her at the monorail station, is pretty incredible, showcasing the depths of the two’s bond that they have reached. After spending the entire day visiting shrines, Komiya gives Eita a mass of exam success talismans, from which Eita gives her back the one that she believes will have the best luck. Though not in the same ways, these two have come to deeply care about one another, and their pushing for each other to succeed despite the fact that it might be painful is one of the most touching things that has come out of this show so far. Though these two episodes did have the show’s sort of trademark lightness to it, it nevertheless stepped on the gas in having its cast really come to terms with the future, and what it means for them going ahead. There are clearly going to be some difficult times ahead in the final two episodes, but I’m nevertheless excited to see how these dorks blossom in the end. Two strong eps, setting up the finale… I was amazed at how they just kept hitting their marks. I don’t think there’s a real misstep in the entire series. Honestly, it surprised me with each episode. I was always thinking “okay, it’s been good, but this is the episode that’ll let me down, isn’t it?”, and it never did once, really. It had a lot of competition, but it ended up being my highest pick for the season. Just incredible through and through, even amongst production issues.